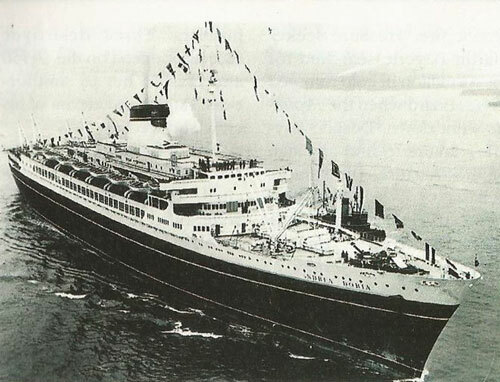 Andrea Doria was the flagship for the Italia Line. As far back as 1974, Gary Gentile reported deterioration on the wreck. He used to tie into the promenade deck at about 170 feet. If the visibility cooperated, divers could get a good look at the liner. Resting on its starboard side, its sliding glass windows and portholes stood out like small targets on a rifle range. Broken inward from the intense water pressure, their frames and surrounding steel hull teemed with sea anemones. Even then, most of the upper structure, including the bridge and smokestack, had fallen into a twisted heap of metal on the ocean floor. 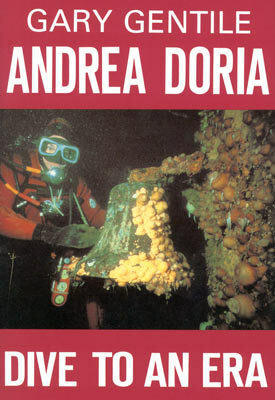 Many books have captured the saga of the Andrea Doria including Out of the Fog, Collision Course, Deep Descent and Lost Liners. One of the best is Gary Gentile’s Andrea Doria: Dive to an Era. 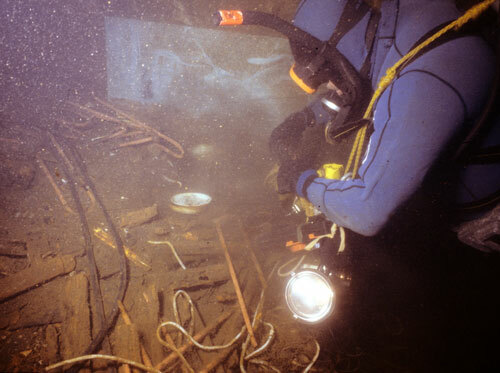 A native of Philadelphia, now residing in Jim Thorpe, Pennsylvania, Gentile has logged more than 100 dives to the wreck. He, along with Bill Nagle, Tom Packer and other dive team members recovered the ship’s bell. Packer and the anemone-encrusted bell are featured on the cover of the book. Gentile’s discovery of the “Negozio,” (Italian for Gift Shop) in the first class foyer became a hair raising experience. His entrance was a black hole where he swam down past dangling wire cables to reach a small, cluttered room. The beam of his light showed 220 feet on his depth gauge and what appeared to be shelving and overturned display cases. The light also exposed shiny objects sticking out of the mud and silt beneath him. Quickly opening his mesh bag, Gentile plucked handfuls of the mud encrusted objects and jammed them in. As the bag grew heavier, he sank down into the ooze creating zero visibility. Disorientated, but not panicky, he moved slowly toward the exit and ran into a blank wall. Cool yet concerned, he froze and waited patiently for the silt storm to settle. When his light picked up some risers—the vertical face of stairsteps—he knew he had overshot his mark. Backtracking cautiously, he avoided a “spiderweb of hanging wires,” all the while looking above for more of them. Breathing a sigh of relief, he saw a comforting green glow…the light filtering down from the entrance to the black hole. Back aboard the dive boat, Gentile’s buddies cheered when he dumped the bag’s contents on to the deck. He had hit a jackpot of necklaces, rings, earrings, bracelets, rosaries, figurines, hand-forged spoons with a painting of the ship on them and more. The Dame’s Negozio had served him well. Interesting article and beautiful photos! It’s too bad the ship is falling apart so badly. Was Gary able to keep the artifacts he found or did he have to turn them in to someone? Sounds like there were some amazing finds! I’m glad you liked the article.It was interesting to write about the Grand Old Dame. Yes, Gary and the other divers throughout the years kept their artifacts. The Andrea Doria is in international waters. Any wreck from the shoreline to three miles out belongs to the state whose shores it’s off of. The Andrea Doria is 50 miles offshore. 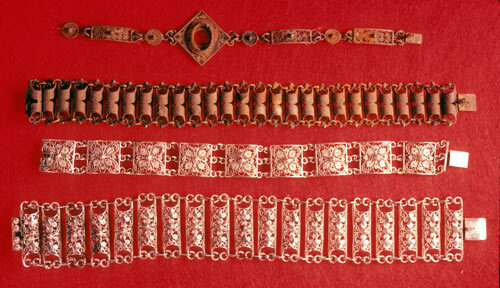 Divers have donated some of their artifacts to museums.